Self Tanning Xen Tan Face Tanner. 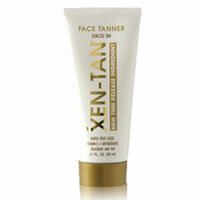 Xen-Tan Face Tanner is a sunless tan specifically for the face. Xen-Tan Face Tanner contains powerful antioxidants, Vitamin E and gentle fruit acids to smooth the skin on the face and throat, while Green Tea, Milk Thistle and Aloe provide smoothing and soothing ingredients for even the most sensitive of skins. Apply daily for a beautiful self-tan and facial treatment in one. New time-release ingredient for a truly brown colour and the most even tan.